Infinity Blackstone, known as Finn, is the daughter of technology magnate Richard Blackstone, a man famous around the world for his brilliant inventions that have revolutionised people’s lives. Yet to Finn, he’s a stranger, a man she’s met only once. Raised by her guardian, Jonah, since her mother’s death in childbirth, Finn has led an unusually secluded life but, now at 17, she’s finally got her wish to attend school with others her own age. However, Finn’s dreams are becoming more and more realistic, filled with violence and vivid impressions of a life that seems more real than her own memories. When an opportunity arises for a school trip to Blackstone Technologies, Finn could at last see her father and perhaps there she can find out the truth behind her dreams but truth comes with a price and the cost may be too much for a 17 year-old to handle. 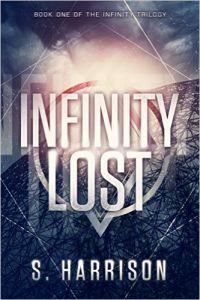 ‘Infinity Lost’ is the first book in the ‘Infinity Trilogy’ by S. Harrison. I picked it up because I hadn’t read much YA fiction this year and thought the premise sounded vaguely interesting. I was expecting a fairly easy read, which it was, but I wasn’t expecting to be blown away, particularly not by a debut novel that was less than 250 pages long. As it turned out, I loved this book and really can’t wait to get hold of the next books in the series. Does it have flaws? Of course it does. There’s a ‘twist’ and it’s very predictable. In fact, you’ll probably work it out in the first couple of chapters but then it’s fun seeing how Finn works things out so it doesn’t matter that it comes as no surprise to the readers. The characters could do with a little something extra, too, because, apart from Finn, who is necessarily fairly complex, and Jonah, who is nicely realised, there isn’t a great deal of depth. There are a few fairly stereotypical teen-agers and some interesting adult characters, like the creepy nurse, that don’t really get enough space to shine, but for the most part they’re reasonably generic. However, this book carried me along from page one, right to the very end, with scarcely a pause to make a cup of tea. I even missed my bus stop at one point because I was so engrossed in the story. There’s plenty of action, with some great fight sequences dotted through the book. The pacing was good, featuring reflective moments mixed in with some really fast-paced tension-filled elements built in. The style worked well, too. I’m not usually a fan of jumping around between time periods but, for the most part, I thought it was used very effectively to bring in Finn’s background and start planting the ideas in your head about where the book was going to take you. There were a couple of points where it was initially hard to tell whether you were in the present day or thinking back to past events, but it soon became clear. I’m struggling to explain why I loved this so much because, objectively, I can see where some people might find it lacking. However, for me, the plot and the writing style somehow made it one of those books where I kept saying ‘just one more chapter’, and that’s the magic of a good story, isn’t it? I really wanted to see what would happen when Finn met her father. I was so curious about Blackstone Technologies and what the kids would experience on their school trip and, without spoilers, I can say that it certainly sounded more interesting than any school trip I ever went on! I wanted to explore this high-tech world and I wanted to explore it with Finn, who was a great central character. This is a YA book, aimed (I think) at readers aged 13 and upwards. I’m 32 and loved it and can definitely picture my 13 year-old self staying up late with the torch under the covers to find out what happened next. ‘Infinity Lost’ has been one of my favourite reads of 2015 and I look forward to the next adventures with Finn in book two of this series.